Hospitals & Health Networks named Johns Hopkins All Children’s Hospital to its 2016 Most Wired Hospitals and Health Systems list. The list, based on the Most Wired Survey, serves as a benchmark for excellence in IT and health data security, examining how organizations leverage IT to improve performance for value-based health care. Each year, hospitals included on the Most Wired list must meet criteria in four key areas, including infrastructure, business and administrative management, clinical quality and safety and clinical integration. 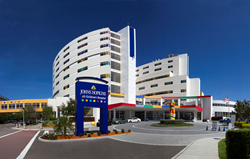 Johns Hopkins All Children’s is the only children’s hospital on Florida’s west coast to be named to this year’s list. More than two-thousand hospitals, roughly 34 percent of U.S. hospitals, participated in the survey. Detailed results and more information on the 2016 Most Wired Hospitals will be available in the July issue of Hospitals & Health Networks magazine. The full list of winners can be found at http://www.hhnmag.com.